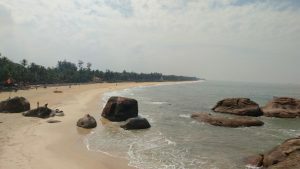 About 15 kms south of Udupi (on the way to Mangalore) lies a delightful strip of sand and surf called Kapu. I had come to Udupi to meet my nephew, who studies at the Manipal Institute of Technology. One morning during my two-day stay there, I found myself free. My nephew would be in class till the afternoon, after which he would meet me. 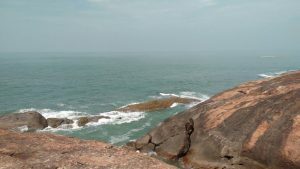 On a sudden whim, I decided to visit one of the beaches dotting the beautiful coastline of Dakshin Kannada (meaning, South Karnataka). 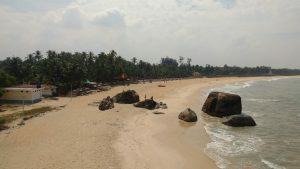 After some serious thought (because there is an overdose of options), I plumped for Kapu beach (some locals call it Kaap). 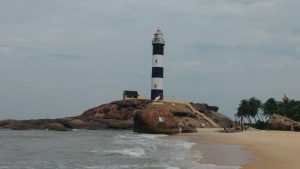 Kapu was most convenient for a half-day trip, because it is situated just 15 kms from the town of Udupi where I was shacked up. Buses were frequent. I could visit the beach and be back in time to meet my nephew. After a breakfast of medu vada and dosa, accompanied by coconut chutney and sambar, I boarded an ‘express’ bus to Mangalore. Unlike regular buses, express buses take the highway to Mangalore and do not get into country roads. They are therefore much faster than their ordinary cousins. About 25 minutes later, I was deposited at the Kapu junction on the same highway. The ticket cost me all of Rs. 18. 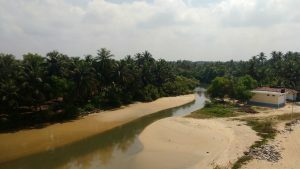 On the way, I was treated to delightful vistas of coconut palms and arecanut trees, old-style houses with brown tiled roofs, ponds and lagoons and small shops lining the highway. 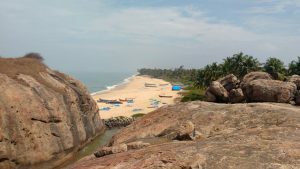 The landscape here is very similar to that of Kerala, since Dakshin Kannada lies just north of Kerala along the same coastline. Even the cuisine (especially the seafood dishes) are prepared and eaten the same way as in Kerala. Disembarking from the bus at Kapu junction, I took an auto to Kapu beach. The ride cost me Rs. 30/- . Autos have fixed fares from the junction to different places in the area. Bargaining is not of much use, since the auto drivers operate as a union. Passing through shaded country roads with houses on either side (and even the odd motor garage), I reached the beach in 5 minutes. Standing at the entrance to the beach, I took in the entire stretch in one glance. Close by to my right at one end of the beach stood the lighthouse, a somewhat grim and lonely apparition rising into the sky. To my left, the sandy strip curved a long way until it ran into a clump of boulders that marked the other end of the beach. A concrete pathway had been built along the inner edge of the beach and stone benches had been built along this. Through the intense haze of the summer morning, I could see that the beach was deserted. There must have been just a dozen people scattered along its entire length. Some of them were lounging on the benches in the shade of coconut trees (understandable, given the heat), but surprisingly, some other were frolicking in the rushing waters. But then, I remembered that while even during the height of summer, the sea water is cool. After standing in the water myself for a few minutes, I started walking towards the lighthouse. At some distance into the sea, I could see a lone fishing boat bobbing in the waves. This fisherman must have come late to the fishing party, I speculate idly. Or maybe, he just had a refreshing beer and gone off to sleep. The instant this thought flashed through my mind, I yearned for a bottle of cold beer myself. My thirst for beer was so bad in that instant, that the hair on my arms bristled and I could clearly feel the parched bottom of my throat. I had to climb up three flights of stairs to reach the base of the lighthouse (because it was perched on top of a boulder). I saw to my disappointment that it was closed. I could not spot the caretaker either. It wondered if it is an abandoned lighthouse. Or maybe it would open only at night, when ships and boats had to be guided. Climbing to the top of lighthouses and gazing out in all directions is something I love doing. I have done it in several places, like Chennai, Kannur and Daman. Not finding anybody to ask, I plonked myself down in the shade of the tall structure. This vantage point gave me a different perspective of the whole area. To my right, I saw another beach stretching out into the distance. A few fishing boats were parked on the sand and a few mesh nets spread out next to them. The fishermen will claim them again before dawn the next day, when they put out to sea in search of fish. On another side, a shallow stretch of backwater flowed past to form a lagoon. Far away into the sea, I could make out a few dots. I assumed them to be cruise or cargo ships. The breeze was mild. It was all very peaceful and life seemed very good from my perch. It seemed better still, when, a moment later, I remembered that I was lazing on a beach on a weekday. I did want to get into the water and splash around a bit, but the sun was too harsh for that. 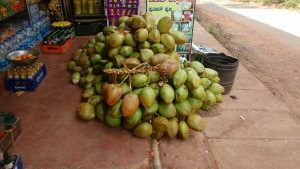 Instead, I had a super-refreshing tender coconut and caught a bus back to Udupi. I am going to return to the Udupi belt during the monsoon this year, when this whole belt will be lush and wet. I just can’t for that. The fastest and cheapest way to reach Kapu is to take an Express bus from the private bus stand, which is locally known as service bus stand also. The bus ride to Kapu junction on the highway takes about 20 minutes and costs Rs. From the highway, take an auto to the beach. This ride cost me Rs. 30/- one way in March 2018. The waves in the beach are wild; so, tread carefully in the waters. I did not see a lifeguard around. This is a relatively unspoilt beach. . The local village council & citizens take pains to keep the beach clean. Let us help them keep it that way. Look for trash bins to dump your trash in. Alternatively, put your trash in your bag and bring it back to your hotel to dump. There are no resorts or hotels close to the beach. Thank God for that. 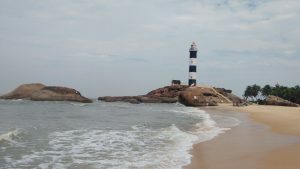 For accommodation, Udupi is the nearest town. It will make sense for you to stay there, also because Udupi has other attractions, and is a bus & rail hub. Summer (I am talking temperature in the high thirties & extreme humidity) is from March to early June here, after which the monsoon sets in. The monsoon is a magical time to visit this place in. Failing that, you could go anytime between November and February. If you keep about a week, you can cover a few lovely places in the Dakshin Kannada belt. Most people here have a traditional mindset and lifestyle; so, covering up adequately and not being boisterously Bohemian would be a very good idea. Sample the seafood and vegetarian food, both of which are yummy in these parts. In fact, a number of people have migrated from Udupi to various parts of India and set up vegetarian restaurants. These restaurants are famously called Udupi restaurants, especially in Chennai, Pune and Mumbai.